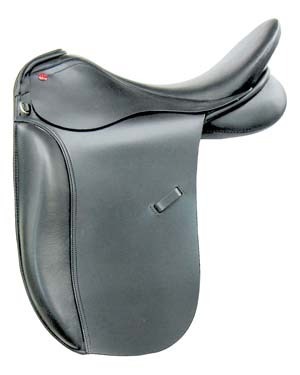 The NEW 2016 Thornhill Pro-Trainer 24K CCD Monoflap dressage saddle features our very best updated design. 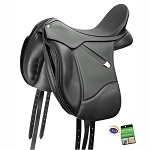 The exchangeable gullet system allows you to customize this saddle to fit various horses within minutes. 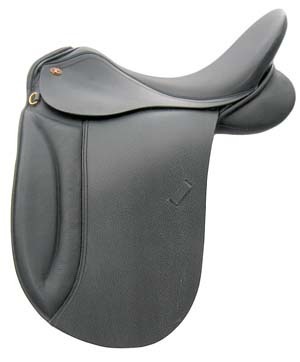 Narrower twist for rider comfort and external thigh blocks for secure, correct leg placement combined with the monoflap design for closest contact feel make this saddle a dream come true for the serious dressage rider. Lightweight memory/flex tree with a deep balanced seat over a broad gullet and wide shaped AMS panels. Panels feature a breathable neoprene lining and synthetic wool flocking for maximum back comfort and elimination of hot spots. Made from premium supple black vegetable tanned leather for comfort and grip. Nice, narrow twist and external thigh blocks. "As well as being a retailer, my children and I have been training and showing exclusively in Thornhill saddles for the last 16 years, and I love the superb quality, craftsmanship, and balanced design that these saddles offer."